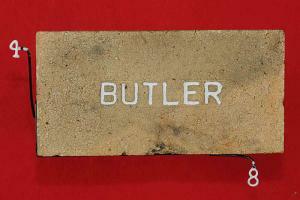 • Maker : ELGIN-BUTLER BRICK CO.
ELGIN-BUTLER BRICK COMPANY. The Elgin-Butler Brick Company, with central operations at a 1,000-acre site in Butler, five miles east of Elgin, and sales headquarters in Austin, is a fifth-generation family-owned business that ships bricks nationwide and internationally. In 1871 the Texas and New Orleans Railroad arrived at the site in Bastrop County, and the community that grew up came to be known as Butler, after an Irish immigrant bricklayer, Michael Butler, who was the first to make bricks from the nearby clay pits that he discovered by accident while digging holes on land then used for timber. The company was founded in 1873. Over the years Butler became a company town with a company store and brick houses for employees, who farmed on the side. By the 1940s the town population reached 150. The company also mined clay from a site now in the Zilker Park soccer fields in Austin and transported it in buckets, hung from mule-drawn lines, to kilns on the site of present Austin High School. Another plant was located farther down the lake at the site of the Zachary Scottqv Theatre. In 1912 the firm acquired the Austin Brick Company, and in 1965 it acquired its chief competitor, Elgin Standard Brick Company. The company supplied bricks for the Capitol, 80 percent of the brick structures at the University of Texas at Austin, fireplaces in many Austin residences, and many other brick buildings in Austin. Brick from the firm was also used for the façade of the United States Embassy in Mexico City. In 1990 the company began using automation to mix the clay with water and to compress and extrude it into molds before baking. The company is noted for its innovative brick designs, produced to appeal to people living in different regions. In operating the firm, Butler was succeeded by members of his family, including a son who studied ceramic engineering at Ohio State University. In the 1990s Elgin-Butler employed 411 workers. At that time 15 percent of its business was from the Austin area and 30 percent from outside Texas. Sales in 1993 amounted to $18 million. Austin American-Statesman, September 10, 1990. Diana J. Kleiner, "ELGIN-BUTLER BRICK COMPANY," Handbook of Texas Online (http://www.tshaonline.org/handbook/online/articles/dleqk), accessed August 23, 2012. Published by the Texas State Historical Association.